In the classroom as a knowledge building community, learners are concerned with understanding, based on their real problems in the real world. Learning is more than the acquisition of the ability to think; it is the acquisition of many specialized abilities for thinking about a variety of things. It is not so important to have all the answers as to be hungry for them. Go to Reading Rockets and read more about knowledge building! Knowledge building occurs when students extend their understanding of a concept or skill. Knowledge and understanding, also called schemas, provide the foundation for learning in all areas. Extending students’ experiences and their exposure to new concepts, and encouraging inquiry and exploration all enhance students’ thinking skills and their development of knowledge. Provide students with opportunities to activate their prior knowledge and think critically about new information. Ask open-ended questions and encourage students to share a variety of ideas and experiences related to the concept being taught. Teach strategies to organize and apply new and existing knowledge. For example, integrate science and literacy by having students discuss connections between habitats. 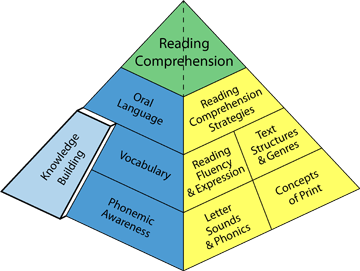 Knowledge building can be assessed across a variety of subject areas. Record anecdotal notes during discussions and track students’ progress in their ability to process information, collaborate with others and ask questions for further inquiry. Students can also create attainable goals related to their learning. Help students achieve their goals by discussing their strengths and establishing next steps.